The technology combination impresses but, considering the price, it could have more features. No detectable velocity switching and easy to use. Authentic and electric piano sounds. Good effects, plus powerful preamp models and master EQ. Lacks a certain 'wow' factor. Has moments of sounding lifeless. No on/off resonance pedal. Simple, yet classy looks make the CP1 nice to look at. The CP1's size and weight make transporting it sans-roadie a fairly epic task. Yamaha have, it's fair to say, always been at the forefront of stage piano technology. The first pianos to wear the CP badge were the now-classic CP70/80 electric grands, adopted by many big-name artists over the years. 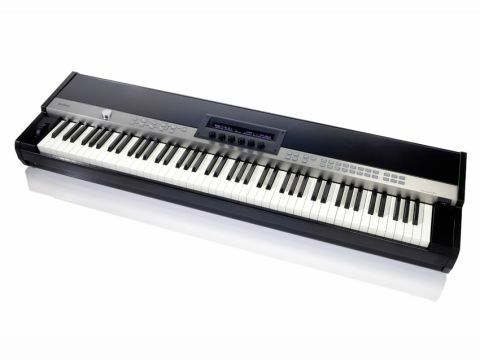 As with the recently-launched Roland V Piano, the Yamaha CP1 uses modelling technology (combined with sampling) to capture the nuances of a real piano. However, while VA synths get close to the magic of real analogue, modelling technology is still in its infancy compared to purely sample-based pianos. At nearly five feet in length, well over a foot deep and weighing in at a notch under 60lbs, this is not something suitable for gigging with unless you have plenty of helpers and an estate car or hatchback with its rear seats down. "In terms of sound, the CP1 is pretty impressive, and it's hard to detect any velocity sample switching." On tour with roadies or in studio residence? No problem, of course - though when you also consider that it needs a flight case, the prospect of moving it becomes even scarier. Looks-wise, the CP1 is utilitarian yet classy. It has a textured metal case with black/brown wooden end panels, a brushed aluminium panel housing the switches and a faux-leatherette top suitable for standing a laptop or small second keyboard on. There's a good-sized vacuum fluorescent display with six push-rotaries for direct access to the most important parameters. Sound selection is via the Preset/User/External buttons in combination with 16 Patch-Selection switches. All switches have LEDs that flash depending on if they are in Edit mode, or to signify if a particular selector switch is on or off. The 88-note keybed is an all-new design. It's very playable, nicely weighted and not too heavy, though perhaps a little more sluggish responding to faster runs than we would have liked. But, in general, it's very good indeed. The signal path is logically laid out in blocks on the front panel. First up is the Piano button block, where any of the 17 piano/electric piano modes can be selected. There are several acoustic pianos, plus Rhodes and Wurlitzer piano emulations and DX7 emulations. These can then be fed through modelled preamp stages based on preamps and speakers found in Rhodes and Wurlitzer pianos. Following this is a Modulation block, where sounds can be processed through chorus, phaser, wah, flange and symphonic effects. These effects are musical and warm, really helping to bring the sounds to life. The Power Amp section is again modelled on Rhodes and Wurlitzer designs, but also includes a vintage compressor for extra punch and level control. It's powerful and authentic-sounding, adding real guts and finesse to the dry sounds. Next is the Reverb block, containing eight reverbs which include stage, room and hall emulations though, surprisingly, there's no delay. Finally, there's a very powerful Master EQ section with selectable peak and shelf and adjustable 'Q' parameters for each band, enabling detailed customisation of every sound. Nothing to complain about here! With regard to customising the CP1's sounds, there's plenty of control for all piano types, ranging from hammer hardness, hammer strike position to note decay. Using these functions really helps you to connect to the CP1 - much as if you were tweaking the pianos themselves - making it feel much more like a real instrument than some entirely sample-based pianos. The preamp and Power Amp models are also some of the best we've heard and greatly enhance the raw sounds plus they can be interchanged with different pianos, while the five-band EQ is very powerful, too. The modulation effects add a bit of extra mojo to the sounds, giving welcome movement and life, but the reverbs, though decent enough, aren't particularly amazing. Though there's very little to criticise in terms of tweakability or playability, it would still have been great to have more adjustment for the Rhodes sounds and the ability to choose different strings for the acoustics. It's a real shame there's no pedal on/off resonance, especially given that it's a flagship instrument. The CP1 is two-part multitimbral and up to two sounds (such as Rhodes and Piano) can be layered with little menu diving - ease of use is something that shines through on the CP1. Any major function can also be user-assigned to any of the dials and set to appear on the screen in the main performance mode, enabling you to have all your favourite parameters to hand at all times. In terms of sound, the CP1 is pretty impressive; it's hard to detect any velocity sample switching, so the response is smooth throughout the playing range and frequency spectrum. However, it's not without fault and some of the sounds can be a little lifeless and boxy. The S6 model sounds a little too nasal for our liking, though EQing does help. You also end up relying on the effects and EQs rather than using the dry sounds on their own. Not to say that the piano/electric pianos aren't good in isolation, but they can lack a certain sparkle and movement. These criticisms aside, our favourite sounds include the CF grand and the CP80 - as well as the 75 Rhodes model with stereo panning turned on. Overall, the CP1 is a mixed bag. On one hand, on a playing and tweaking level, you feel a real connection with it. On the other, We can't help feeling that although it does sound good, it lacks a certain magic that you'd naturally expect from a piano at this price point. The overall sound and the technology used are certainly impressive, but we were hoping for more 'wow' factor.